Well-known for their stunning world-class photography, 1x.com has worked with their most talented photographers to handpick 100 awe-inspiring images and provided the back-story and photographer's secrets that helped capture them. 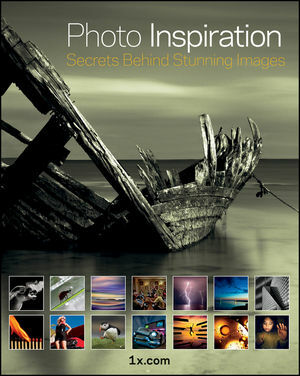 This book presents you with inspiration as well as underlying techniques that can help improve your photography skills immediately. Photo Inspiration provides a unique combination of the final photograph with the tools and knowledge that made it possible, all of which are aimed at helping you meet your photographic potential. 1x.com is a unique concept in online photo galleries. Photos published on the site  roughly 1 of every 20 submitted from around the globe  are selected by professional curators. The site features a social network, tutorials, a forum, and peer reviews. Many of the images are for sale as fine art prints.